Less is More? Holga Digital Smashes Kickstarter Funding Goal. With almost a month left to go, how has yet another seemingly redundant piece of camera technology found itself successfully funded on Kickstarter? We’re talking of course of the recently introduced Holga Digital, the latest in a long line of intentionally tacky cameras from the Chinese firm. The question you might ask is how a product that outputs poor quality images that any digital camera is capable of making could prove so popular. 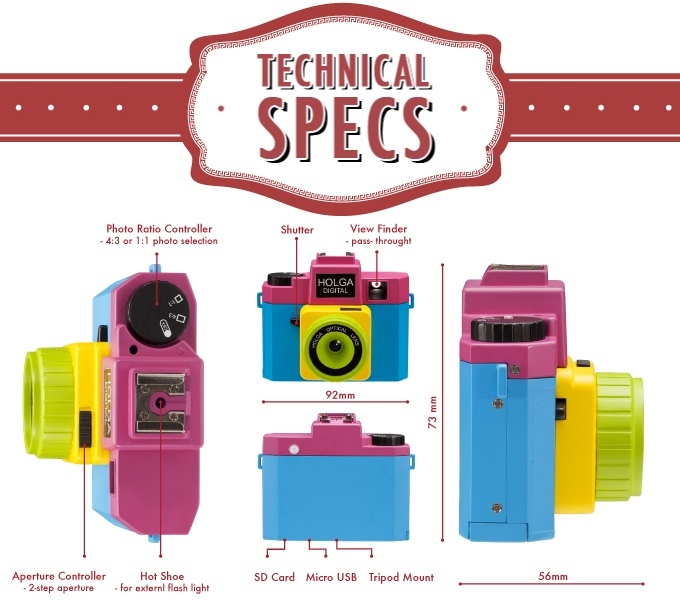 A digital camera that has been intentionally marketed and designed with limited functions. There is absolutely no ‘new’ technology available with the camera, if anything it’s the lack of tech that might just be its unique selling point. I spent some time considering the appeal the colourful looking adult-toy might have and indeed its lack of high-tech, ground breaking features might be what makes it endearing. Of course the Holga brand is popular already and has a steadily growing fan base filled with people who are committed to buying whatever is new on the product line just as an Apple enthusiast would be for the latest iPhone. Perhaps the most unusual ‘feature’ of the Holga Digital is its lack of LCD screen on the back. There is nowhere to review or worse, chimp through your photographs. It may seem counterproductive, but the fact its not there may instil a bit of the magic that has been lost in our age of instant gratification. The entire range of Sony Alpha cameras available today have even done away with optical viewfinders, instead they’ve been replaced with garish tiny LCD displays inside the arched roof – perhaps a disconnect from the subject one step too far for some photographers. It’s no wonder that people are grasping at ways to feel closer to the scenes they’re taking. Remember those days when things broke, we fixed it? Of course the lo-fi functionality of the camera is easier for our minds to understand. Instead of a mass of circuitry, multitude of functions, wheels and dials we’re presented with a plastic box that might as well just been 3D printed. Perhaps its simplicity in design (some may prefer to call it tacky) proves that to engage people in the arts and photography more is not always better. We’re still on the fence with this one, but have to admit the interest and success of the Kickstarter has piqued our interest and look forward to seeing if the Holga community develops and thrives with its new found digital technology. Next Article Selfie from Hell – Short Scary Film that might just make you Jump.